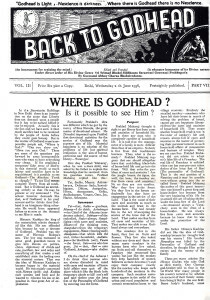 Back to Godhead > Prabhupada > Where is Godhead? Is it possible to see Him? Is it possible to see Him? In the Secretariat Buildings in New Delhi there is an inscription on the stone that Liberty does not descend upon a people but it has to be earned before it can be enjoyed. Actually this is the fact and we have seen it that much sacrifice had to be rendered by the people of India before they could gain Swaraj. But in the matter of Godhead some irresponsible people ask, “Where is God?” “Can you show me?” “Have you seen God?” These are some of the questions put forward by some irresponsible men who want to have everything very cheap. If for attaining a temporary false sense of liberty in this material world so much labour and sacrifice have to be requisitioned is it possible to see Godhead-The Absolute Truth so cheaply? To see God means complete liberty from all conditions. But is Godhead an attending orderly so that He may be present at my command? The atheist however demands like that, as if Godhead is his paid servant and he thinks that Godhead is an imaginary thing otherwise He would have appeared before us as soon as the demand to see Him is made. Hiranya Kashipu the king of the materialistic atheist demanded like this. His son offended him because he was a devotee of Godhead. Prahlad was the name of Hiranya Kashipu’s son. The boy was entrusted to some good guardian tutors to give him lessons on politics, civics, diplomacy of divide and rule, pacifism, law and order and everything all that makes a well established state for lording over the material nature. That was the idea of Hiranya Kashipu to become happy in the material world. He was mainly concerned with Hiranya (gold) and Kashipu (soft women and bed) and he wanted to educate his son or dependant in that great Art of exploitation. Tat, Sadhu, Manny, Ashurabaryya, Dehinam, Sada, Samud-bignam, Dhiam, Asatgrahat, Hitwa, Atmapatam, Griha, Andhakupam, Vanam, Gato, Jat, Harim, Ashrayeta. Tat=that, Sadhu=goodness, Mannay=I do think, Ashurabaryya=the Chief of the Ashuras (nondevotee atheist), Dehinam=of the embodied, Sada=always, Samud-bighna=with cares and anxieties, Dhiam=of the thinking men, Asatgrahat=from the temporary engagement, Hitwa=leaving aside, Atmapatam=that which kills the soul, Griha=household, Andhakupam=the black hole (well), Vanam=the forest, Gato=one who has gone, Jat=that, Hari=unto Godhead, Ashrayeta=take shelter of. Oh the chief of the Ashuras! I do think that persons who are always disturbed in mind with cares and anxieties of household affairs may quit off the place which is like the black hole temporary abode to kill one’s self and take shelter unto the lotus feet of the Personality of Godhead by entering into the forest. Prahlad Maharaj thought it right to get liberty first from cares and anxieties of household life. But is there any man who is completely carefree of household life. It is said that the management of a family is more difficult than that of an empire. Nobody is free from this troublesome business. Then what is the remedy? Prahlad Maharaj suggests that one should altogether leave that soul-killing black hole of household life and go into the forest. Will that solve the problem of cares and anxieties? Are the jungle beasts, the tigers, the wolf, the bear, the monkey etc. free from cares and anxieties? No no they are not carefree. Why they live in the forest. Yes they live in the forests undoubtedly but they have no engagement in the service of the Lord. That is the cause of their cares and anxieties as much as the animals and beast in the human form. The real remedy lies in the act of accepting the service of the lotus feet of the Lord. That makes one free from all cares and anxieties of life. That makes one able to see Godhead always and everywhere. The monkeys live in the forest, they live on fruits and flowers. They live also naked without any dress and there are many many monkeys in the human form who live naked, eat fruits and call themselves as Vanachary (the renounced Sannyasins) but just like the monkey they keep hundreds of women followers as their devotees (?) and enjoy their company exactly like the monkey who keeps such hundreds of she monkeys in the company. Such monkeys sometimes appear in the midst of the urban and rural population and commit tremendous harm to the village economy. Similarly the so-called monkey—vanacharies who have left their home in search of solving the problem of bread, cannot get any happiness liberated from the cares and anxieties of household life. They create another household rendezvous in the order of vanachary’s life and remain always full of cares and anxieties in the matter of protecting their personal interest in such household affairs of monasteries and business of temples. They are not carefree. Prahlad Maharaj did not advise to adopt such false life of a Vanachary. The real life of Vanachary is exhibited when one has cent percent taken shelter of the lotus feet of Hari (The Personality of Godhead). That is the real position of a Vanachary and it may be possible even without going into the so-called forest. Prahlad Maharaj the author of this great instruction was himself a great king and householder but because from the very beginning of his life he practiced the art of taking shelter under the lotus feet of the Lord—he remained always a Vanachary even in the dress of a householder. He was always free from cares and anxieties because he knew that he was under the protection of the Lord. His father Hiranya Kashipu did not like the idea of God-worship because he thought God was his enemy. His brother Hiranakhya was killed by the Personality of Godhead and therefore he thought Him as his enemy and the enemy of the family. There are many atheists like Hiranya Kashipu who take God as their enemy. One German god-brother told us that in the 1st World War many people in his country turned to be atheists on account of their family members being killed in the war field. Somebody’s husband, somebody’s son, or somebody’s brother must have had gone to the war field. When the fighting was going on, all of them prayed for the safe return of their relations. Unfortunately almost all of them did not return back forever in spite of such prayers and therefore they turned to be atheists. They thought that God is their order supplying agent and because the prayer-order of protecting the lives of their relations were not carried out by God, the word ‘God’ is a myth and there is no existence of God. That is the position of cheap God-seekers. They want to see God without the necessary sacrifice and without knowing His actual position as the order supplying agent and if God is not seen in that way of impertinence, the existence of Godhead must be denied by them. Foolish people like Hiranya Kashipu (concerned only with gold and woman) is bewildered to see Godhead. In the Bhagwat Geeta it is said that the Personality of Godhead is not exposed to the eyes of everyone but He is existent always and everywhere by His omnipresent impersonal features. In the ‘Brahma Sangheeta‘ it is advised that one can see Him in the Sun, which is said to be His one of the eyeballs. As the eyeball rolls within the hole, so also the sun is rolling within its limited orbit. His impersonal features are described in the Bhagwat Geeta and one can see Him everywhere as the banyan tree, the lion, the shark, the Himalaya, the ocean and everything that is extraordinarily powerful. He is the seed of growth of every living being and by His potencies the whole universe is rolling on. The strength of gravitation that sustains the planets in their respective positions is also He. He therefore manifests Himself by His diverse energies exactly like the fire which maintains its existence by the power of expanding heat and diffusion of light. He is sometimes compared with the sun. And His different energies are compared with the rays of the sun. The living entities are so many molecular particles emanations from Him as the rays of the sun are innumerable molecular particles of the sun. The sun and the sun-rays are simultaneously one and different. The sun-rays are always at my door, I can feel its intensity of heat, I can see it everywhere. By the sun-rays I can see the sun also although He is far far away from me. At the same time if I am a sane man I can feel it that the sun-rays are not the sun. The sun is simultaneously one and different from the sun-rays. We can imagine the intense heat of the sun by our little and partial experience of the portion of the sun-rays. Ekadesh-In one place, Stithasya-Situated, Agne-Of the fire, Jyotsna-Light, Vistrina-Diffusion, Jatha-As is, Parasya-Of the Supreme, Brahmana-Of the Brahma, Sakti-Potencies, Tatha-So so, Edam-This, Akhilam-The whole, Jagat-Universe. This whole universe is the manifestation of diverse potencies of the Supreme Absolute Truth just like the fire situated in one place can diffuse its light all round. The Personality of Godhead does not become impersonal for the matter of His impersonal potencies. He is non-different from His impersonal manifestations but that does not make Him without Personality. His omnipotency suggests that He is originally the Supreme Person and He has expanded Himself by plenary portions and differentiated parts and parcels. Atheist Hiranya Kashipu wanted to see Godhead and he asked Prahlad his son where is his (Prahlad’s) God? The child Prahlad answered that his God is seen everywhere. That is the vision of a devotee. The devotee does not see anything except his Godhead. Anything animate or inanimate exhibits Godhead in the eyes of a devotee. The devotee’s eyes are anointed with the pulp of Love for Godhead and as such he sees nothing except in relation with Godhead. Sometimes we see the notice in a public garden as follows:— “The garden belongs to you and you should try to maintain it by the such feeling.” The same notice is sometimes seen in the railway carriage. And the purpose of such notice is to awaken the national feeling of the citizen. A good and trained citizen knows that the Government is run on by his representative and therefore the Government is his own Government. And the property belonging to the Government does also belong to him and he behaves in that way. Therefore he can see everything interrelated with the Government and if he has the necessary national feeling he can see everywhere the Governmental power in its impersonal feature represented. The power and personality of the Government is felt by a good citizen everywhere in the country and this feeling is made possible out of a feeling of national consciousness. This national feeling and love for the country and Government are all products of sincere service for the cause of the nation. And the same thing is applicable in the wider sense when we speak of seeing Godhead. Godhead is not therefore a cheap orderly of the materialistic atheist. Godhead can be seen only by sincere service mood and not by challenge. A person who sees God cheaply in the ordinary way and a person who argues that God cannot be personally seen-both of them are misguided. The Personality of Godhead reserves the right of not being exposed to the vision of a challenging Hiranya Kashipu. That is not the process of realising the Personality of Godhead everywhere. To the eyes of a devotee everything is simultaneously one and different from Godhead. He sees Godhead in everything and everything in Godhead. And that is the highest stage of realisation of Godhead. The impersonal material conception of Godhead under the headings of Pantheism, Henotheism, Monotheism and Polytheism etc., is the beginning process of seeing the Godhead. The next higher stage of seeing Him is the stage seeing the supersoul residing with every individual soul and the highest stage is to realise the Personality of Godhead in the supramental stage of loving service, the spiritual existence. The revealed scriptures therefore warn us against cheap realisation of Godhead. The revealed scriptures definitely says that Godhead cannot be seen with our material eyes, neither He can be perceived by material senses. The eyes and the senses of the devotee must be trained up in the art of transcendental service. The Supreme Lord is sentient and He is clever enough to know our modes of such transcendental loving service and the with progress of such service attitude only the Godhead is realised by the mercy of Godhead. Nobody else can realise Him even by a fraction by speculative habit of flickering mind. “I do give more facility of transcendental service to the devotee who are constantly engaged in My service with love and affection, which will help them to come unto Me.” God helps them who helps themselves by the service attitude of Godhead.